Youth Empowerment – Be Fearless. Be Flagrant. I was overly excited to read this Zine by looked at it alone. The classic black and white marble composition notebook cover felt nostalgic to adolescence: the way it would become decorated with amateur graffiti, magazine cut outs of favorite celebrities and teen heartthrobs glued onto the few empty spaces. Also, 3D Glasses were included to be used on certain pages! 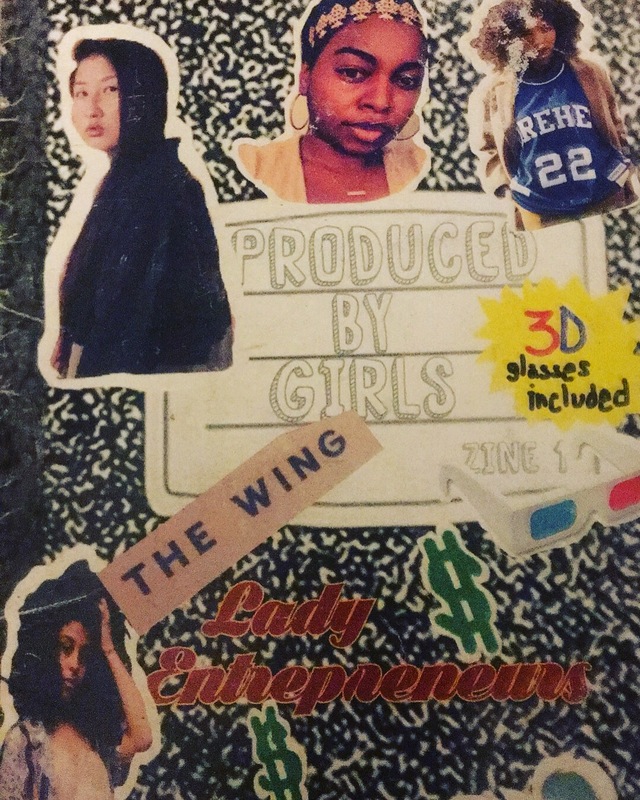 This zine featured 5 talented young women of color, that were pictured on the cover in the cut out form. Each page reflects the personality of the young woman it shared itself with in a magazine cut collage form. The first page featuring Megan Harris- model, artist, graphic designer and part owner of Beatnik Parlor Ice Cream , is covered in a variety of ice cream cones, palm trees and California vibes reflecting Megan’s hometown. Megan is pictured in the lower corner with thick coiled shoulder length hair looking directly into the camera. Megan’s story was deeply inspiring for myself personally with her being just two years older than myself. At 26 she has left her hometown in Sacramento to NYC to further her career. Her advice for to aspiring entrepreneurs was simplistic which made it seem even more achievable for myself and all who read. On the back of Megan’s page is a goals worksheet for the reader to list what goals they have for themselves and business! Annabel’s page is covered with a variety of foods as well as pictures of her food truck/ mobile kitchen. Anabel is pictured in the lower corner, a beautiful young girl smiling holding a toddler in her arms. One of the impressive things about Anabel is that age of eight years old she has already created a delicious diverse menu that feeds many in the DMV area. Her words echo the importance of seeing women and girl bosses, starting as young as herself, proving anything is possible. Alias Kadir’s page background is decorated with large frosted green grapes and light pastel colors. Alias is pictured in the corner with shoulder length curly hair looking away from the camera over her shoulder. This seventeen year old explains how she found comfort in music. Alias also included how she is looking for queer artist and artist of color’s work that she wants to share via her platform. This is also something near and dear to my heart, the inclusion of queer and all artist of color is needed, our work is truly unique and needs more visibility. 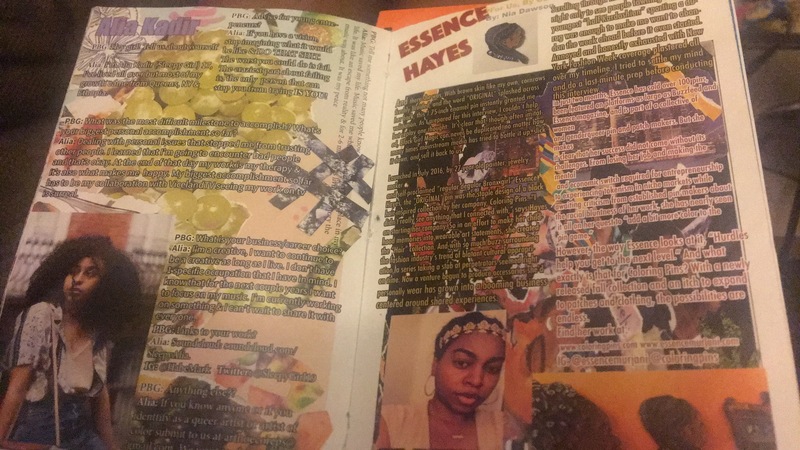 Essence Hayes’ name is spelled out in bold red block letters. Across the back of her page is a city’s outline with building lit up a night sky . By her name and along the bottom of the page are some of her pins. Essence is pictured at the bottom of the page looking directly into the camera. Essence is a painter and jewelry maker that came up with Coloring Pins, a collection of pins that are inspired by black hair styles. Looking at these pins give a more nostalgic feelings as it showcases classic black hair styles as Bantu knots and braids. Essence describes her journey to get her business to where it is today. From her set backs and obstacles, Essence continued on pursing her vision and has no intentions of stopping now. The last lady entrepreneur in this issue is Eli. Using the 3D glasses given at the front of the zine you can see the overlapping red and blue clustered pictures of Eli come to life. Eli’s outlook on art medium and Philosophy was both refreshing and left me excited to see what she will accomplish artisticly. On the next page PBG has an important reminder that the reader can see with the 3D glasses. The last two pages are interactive for the readers encouraging the reader to bring their ideas to life. After reading this Zine I felt revitalize to continue the work that I’ve been doing : with writing, with organizing and modeling . What was most inspirational about these young women is how at their age they have envisioned their dreams and brought them to life. To find out how they succeed and overcame their adversity, read this Zine ! Also show support to these wonderful women by following their social media accounts and their work. Their presence in their fields are needed, let’s make sure it can remain. Having a rough week? Maybe even a rough month? PJ’s recent release This Is What It Looks Like is what you need to power through. Soulful vocals coupled with visuals reminiscent of Carrie Mae Weems’s Kitchen Table Series serve as a powerful reminder that though we all must face obstacles in life, we still find a way to persevere. Even more so, we’re stronger, kinder, and wiser because of it. A gentle prompt that we are the masters of our future, even when it seems we have lost control. Check out the powerful video here. Follow PJ on IG and subscribe to her YouTube channel for more sounds to make your day. In order for a candidate to become president they must have an overwhelming support of the citizens, right? They would at least need more people who want to see them in power than those who would rather they fail. I mean… isn’t that the whole reason why we’re urged to vote? Told our voices matter and all the other propaganda? The 2009 inauguration of President Barack Obama (yes, girl I said President present tense because he’s still my President FOH) had an attendance record of more than 1.8 million according to CNN politics. So where are all the self-hating bigots who voted for Captain Cheezit? They have no problem sitting behind a camera and spewing messages of hate, or even attacking defenseless POC for no justifiable reason, but very few showed up to support the man THEY deemed fit to be in power. When listening to Trump’s inauguration speech the reason becomes a bit clearer. At least to me. His speech was littered with the uses of ‘i’ and ‘me’ as opposed to ‘us’ and ‘we’. ‘I can fix these problems’ and ‘I am the answer’. So maybe Trump’s followers didn’t show because their lazy asses felt their task was done. They screamed hate to the heavens and their Gods have responded. So all that’s left for them to do is sit back and let havoc wreck itself. Even so, We the People should see this as an opening. Our support of love is far greater than their message of hate. The power rests in our hands and it’s up to us to use it to rectify the problems that have plagued America since it’s founding. Let’s make it right one step at a time! This is our call to action. In the mean time in-between time, check out this article with more photos showing the recent inauguration’s lack of attendees.